i’ve written about this before. 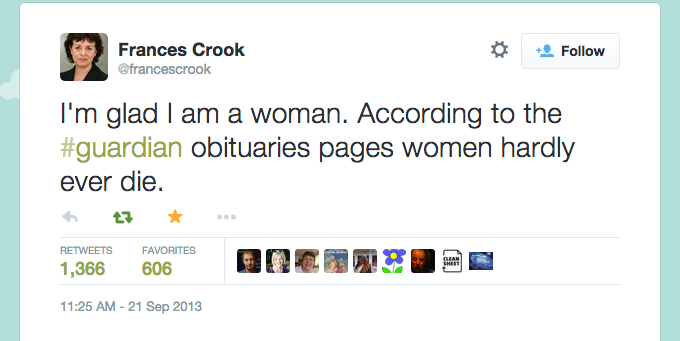 about how the way we write the obituaries of women is infuriating. by which i mean not just the fact that so few of them are written. which is a special kind of maddening that we can kind of justify by saying, well, the accomplishments of women weren’t covered in the press as often in the first 3rd of the 20th century so there are fewer well-known women to eulogize. but i don’t want to talk about the writing we’re not doing about women’s lives. i want to talk about the writing we do, because that’s more tangible and another kind of maddening. we’re been here before: in terms of aging, and more specifically in the cases of lauren bacall, joan fontaine. 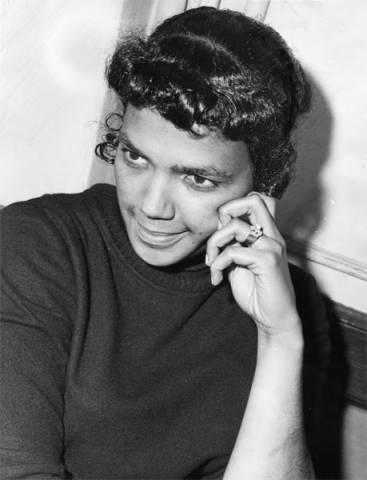 but i don’t know that i’ve ever explicitly tied this to biography, to the power that obituaries wield in crystallizing the story of a life, not just the lives of women but the lives of EVERYONE. not just famous people, but EVERYONE. when a relative of yours dies and you write an obituary, that is an act of life-writing. you are writing about a life. and, perhaps a biographer will see what you’ve written and decide to write a book about that person or perhaps only three people will see it in the local paper and think, oh i knew her when… or perhaps no one will see it because, in your grief, you forgot to submit it to that local paper. 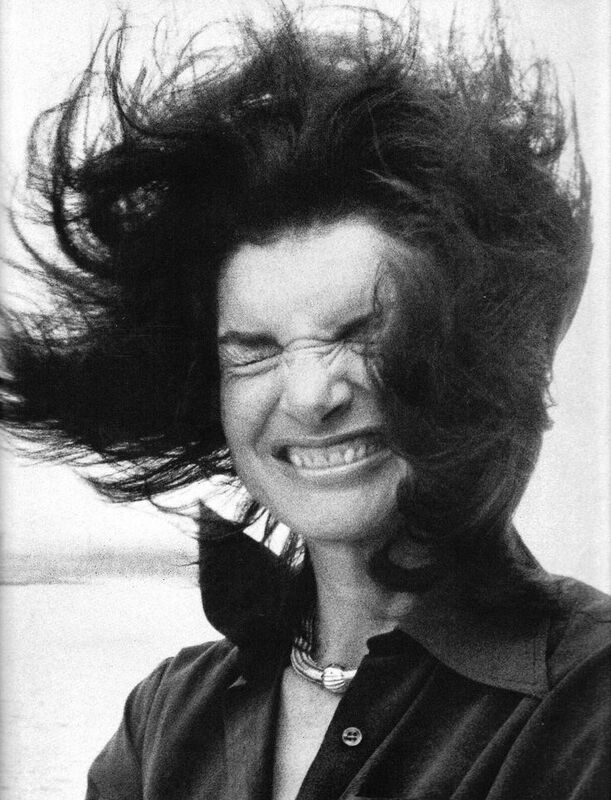 or perhaps your relative was jackie onassis and hundreds of people you don’t know wrote her obituary for you. obituaries are a bit of life-writing that goes up and down the spectrum of society. maybe not everyone has one, but most people do, whether it’s in the NYT, the local paper, the church newsletter or just a family-selected photograph on a funeral home website. and, if you’re the writer in your family, you’re most like gonna have to either write or proof one at some point. obituaries are memorializations. 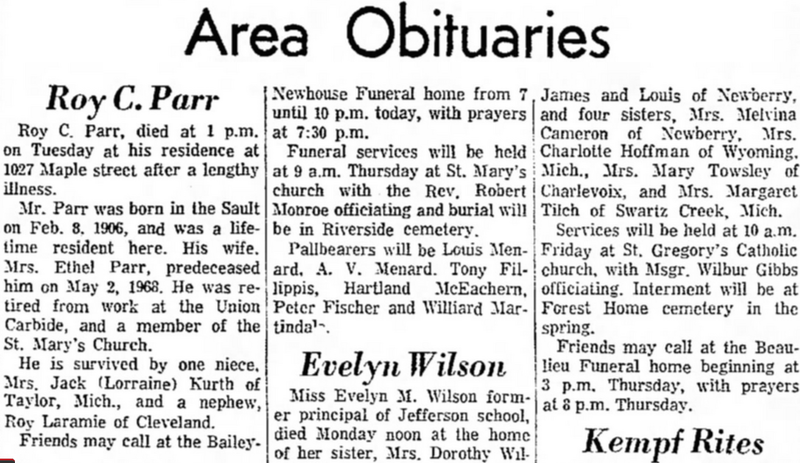 at the micro, an obituary is a family remembering a loved one and alerting the community to his/her death. at the macro, it’s a society wrestling with the life and legacy of a well-known person who has died. the obituary is also the earliest form of posthumous biography, in that it reflects upon the whole of the life; it is writing reflecting on the life in a more analytical way that one gets in contemporary press reports or gossip. the problem with this is that obituaries, as written in most of the mainstream press, are not all that reflective or all that analytical. whilst they wear the vestiges of a biographical piece, they’re still press, and so they more often memorialize the life as presented in the press than reevaluate the life itself. 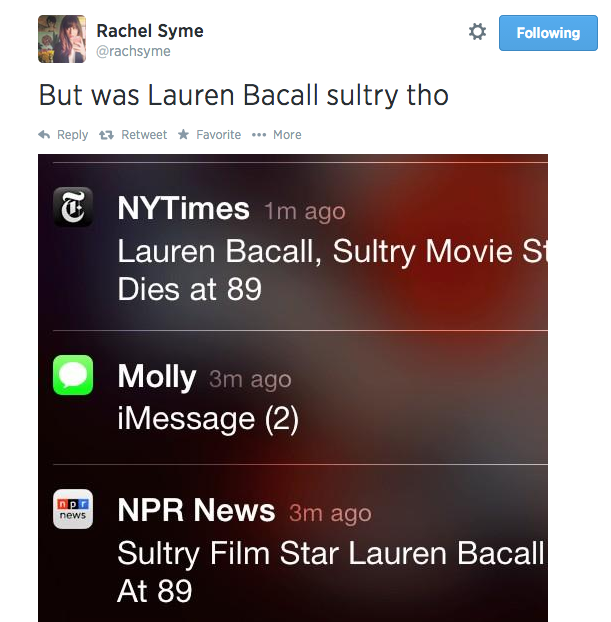 which means bacall is still “sultry” and jackie is still “silent” and fontaine is jealous of her sister forever and ever always. myths every good biographer ever after will have the responsibility of dismantling. i have set up camp in that point of dismantlement so it’s probably no surprise that i find this obituary stuff SO PROBLEMATIC and it fills me with righteous anger. because if the media has historically treated women unequally and you sum up a life by looking at the media reports, you wind up producing a document steeped in all of that sexist press. and that is what sticks. 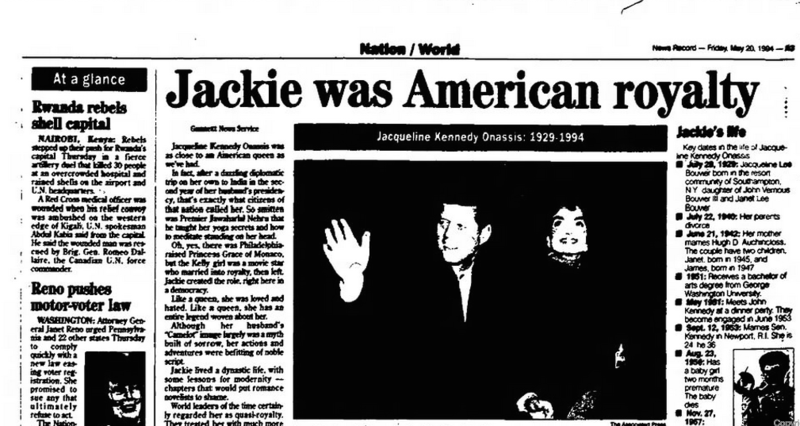 which is why i am asked why jackie never gave any interviews- despite the highly publicized release of the 11 hours of schlesinger interviews 3 years ago. because, twenty years ago, she was eulogized as silent. so elizabeth taylor dies. and someone is given the assignment of writing her obituary. and that someone sits and reflects and contemplates the meaning of elizabeth taylor’s life, her whole life set alongside her accomplishments, and analyzes of what her legacy might be. right then and there in 2011, upon elizabeth taylor’s death, someone would sit down and do and write that. alas, that is not how the world of obituaries works. and so, when elizabeth taylor died, we got a summary of her life from someone who died SIX YEARS BEFORE HER. much was made of this for, like, a day and the people who write obituaries, with some glee, sallied forth to say, oh but that is the way we do things! so we can be totally prepared and really do the life justice by having spent all this time before it was over thinking about it and producing this glorious piece of writing on it. this is bunk, this procedure. not just in terms of obituaries of women but in terms of obituaries of EVERYONE who has their obituary written at this level of the press. just because it’s standard, because they’ve been doing it for years, because it is how papers have always done obituaries, doesn’t mean it’s right. not because it’s weird to write about the undead, but because you write about someone entirely differently when you imagine his/her death versus on the event of his/her death. and because writing obituaries this way culturally sets us back. because, to finally get to what i wanted to talk about… THIS. in truth, this may not have been written in advance. who knows? the NYT is up-front about the fact that news of her death came to them via a funeral home website. which suggests to me that it was prepped, or at least the legal stuff was. the biographical end, not so much. so we get a lot of legacy and not a lot of life. well, there are hints. 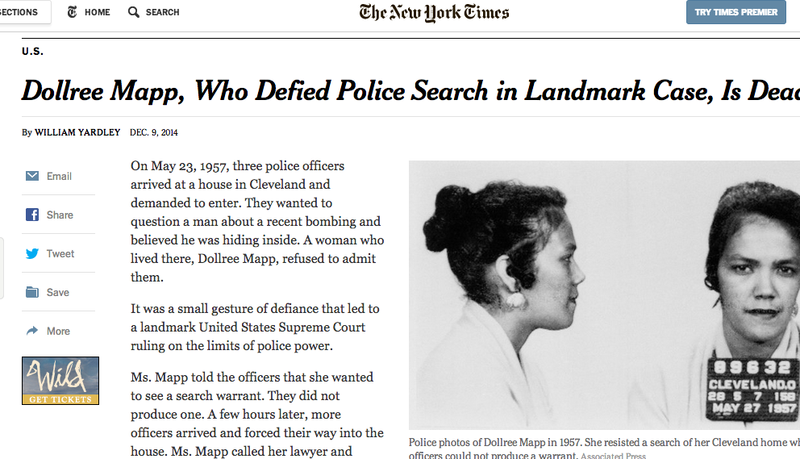 she “defied” police, “resisted a search,” “refused to admit them” in “a small gesture of defiance” that had wide-ranging legal consequences. she stuffed a warrant down her shirt and was called “belligerent.” there were sexually explicit materials in the house. she lived “quietly” after the ruling. there are doubts about her birthdate. doubts about what she’d done subsequently. doubts about survivors. basically all they do have is her rap sheet and props to them for acknowledging the gaps. but what do we know about her, besides her defiance? well, now, this is interesting. she was a “colorful, sometimes brash” person, which is a provocative comment on her personality, leading one to wonder: in what ways was she colorful? how was she brash? two things this paragraph- if we are operating under the rules of high school freshman year composition class- will illuminate. except naw. this is a paragraph about the men to whom she was married/engaged/affiliated. my point would be: DO NOT SAY THAT. tell us about her marriages. tell us facts. do not make a judgement on her personality and then, without supporting it with an anecdote or linking it to anything, pivot to her love life. to return to my earlier giant unsupported claim- that the writing in obituaries culturally sets us back- behold: if we’re trying to make sense of this assessment in the opening clause and place it to some context in the paragraph, then she was “colorful, sometimes brash” because she ran with boxers. there’s some casual but nasty gender, race and class implications wrapped up in those three words and their appearance in this paragraph on this african american woman’s relationship with three african american men. i doubt william yardley or the NYT gave much thought to this seemingly throw away line- the legal stuff is clearly their main concern and why they’ve run the obit at all- but it’s this casualness, this lack of attention to the way we’re writing these things (also reflected in the fetishization of the completely bizarro way they are produced), the words we’re using and the tone. these are people’s lives we’re writing. a reality about which, within the genre and the writing itself, there’s an appalling lack of care. This entry was posted in "women", obituary. Bookmark the permalink.